The ant species Leptothorax acervorum is found throughout the Northern hemisphere. While many populations have multiple queens, a few have only one queen that reproduces. 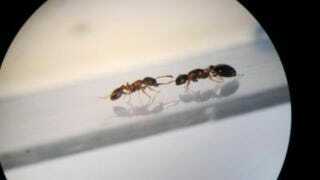 And in those societies, queens and workers alike viciously fight for ant dominance. Researchers from Germany's University of Regensburg examined a Leptothorax acervorum colony in Spain. They found that only one of the many queens in the colony was actually able to reproduce. All the others either did not yet have active ovaries, or their ovaries had actually reverted back to their former inactive state. And it doesn't appear that the ants arrived at this state of affairs peacefully. Prospective queens were observed fighting, boxing with their antennae and threatening each other with their mandibles. These more ritualistic fights appeared relatively tame compared to the no-holds-barred craziness that would go down when worker ants took on queens, which involved way more biting and shoving. It appears only the fights between queens could actually determine which ant would be allowed to reproduce. The workers were fighting more to determine which queens were the most dominant and therefore worthy of their protection. "These ants live high on mountain slopes — which makes dispersal and colony formation difficult. Under these circumstances the colony cannot support more than one reproductive queen and limited resources make it inadvantageous for the colony to allow low ranking queens to leave and start their own colonies. Destruction of habitat, for instance due to climate change, may cause this behaviour to become extinct." Via BMC Ecology. Image by Juergen Trettin.